Discussion in 'Map Factory' started by Connect_Four, Apr 20, 2009. 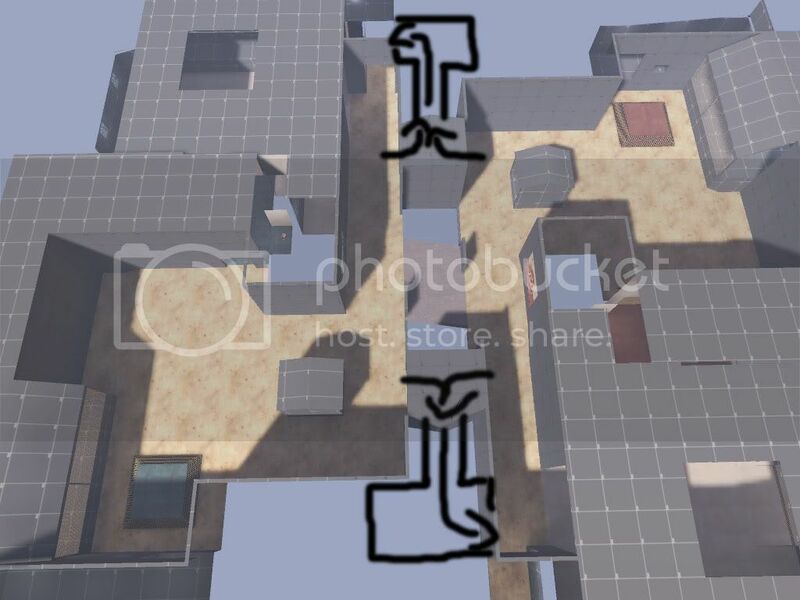 Sandstorm is a twist on your average CTF style of gameplay. You must bring the intel to the enemie's base and plant it at either of the two capture zones. First to 3 caps wins. Please help my improve upon this map by giving helpful feedback, comments, and suggestions. You can't switch classes everywhere in the spawn right now, which is a bit deceptive. It's incredibly small too. There is almost no buffer zone between the bases meaning scouts are going to be incredibly powerful. I can reach the outside cap point as a scout in under 15 seconds and the indoor cap point in just over 15. Defense just doesn't seem very feasible when the points can be reached this quickly. Especially when it can take a Heavy longer than 15 seconds to get to the point if he takes certain paths(like the outside point glass pathway). No elevators. Please think of some work around. There's almost no metal in the map. Engineers are going to have an impossible time setting up. There also seem to be very few places to set up sentries that don't feel catered to, and all of those are very vulnerable to Pyros. The specific positions are irrelevant, but the map is too barren or close range from area to area, so I don't think Engineers will do very well without setting up turtling in areas you've designated to be good Engineers spots. Health kits are way too sparse, especially for offense. For example a sentry on the top side just out of spawn by the indoors point is going to prevent Blue from getting any health while moving to attack the point, the closest health kit is a small one all the way in the shack by the other point. You've also got some small leaks down in the water where the wall meets the water level. Looking foward to playtesting it soon. Be prepared to handle player teaching issues. There's a reason I changed the game mode. OK, so we all played it at gameday. What did you think? Some sort of cavern between the two side tunnels, letting the attacking team fall back and regenerate health. A good place to lay attacking sentries, dispensers, and teleporter exits. I hope this would help give the barrel cap more attention and more action. I can see the need for setup times, but how to achieve the effect of them being their without being extremely ugly(a tall line of fences that suddenly disappear when setup ends doesn't look very good). I hope I can think of a way to achieve such an effect, but I am always open to suggestions. I haven't fully explored all the tool textures that restrict access, only playerclips. But I can see that the use of a tool texture that is a clip would cause questioning as to why you can't access the other side even though its fully accessible by walking. Anyways, I have some things to change for Alpha 2. I'm always open to suggestions, and thank you for playtesting it today. Edited the first post to show the changelog and general information. Check it out sometime. Heh i had to say it before anyone else. Setup time is a little long, i would drop it to 41 seconds *which is 35 ingame* add if possible add some direction in the game. I liked the map however felt confused while playing it as i never really knew what to do. I played Engy most the map and the capture point near the spawn room with the glass wall can be easily locked down. I did notice that I didn't make the catwalk accessible from the middle house. I'll fix that. Also, I was thinking of making another exit from the top spawn, going towards the intel area, and closing off the present exit. -People trying to jump over the middle part, which I playerclipped. I found that I could see through the nodraws and get an advantage over where enemies are if I stand/RJ on the roof. Overall, I think this gameday went well. I need to examine the SourceTV demo soon. If you were at gameday and have suggestions and comments, I am always open for changes. Anything to help me better this map is fully appreciated and acknowledged. I can help with the reverse ctf game ent set up, if you're having issues. Or you can ask DJive how his is set up in temple. I admit I was very confused for the first half or so. I wasn't really sure what to do at all (I know you have to "plant the flag", but I couldn't figure out the rest), so I tried to follow the intel - but when one person goes Scout and runs off like hell with the intel, it's hard to work as a team.